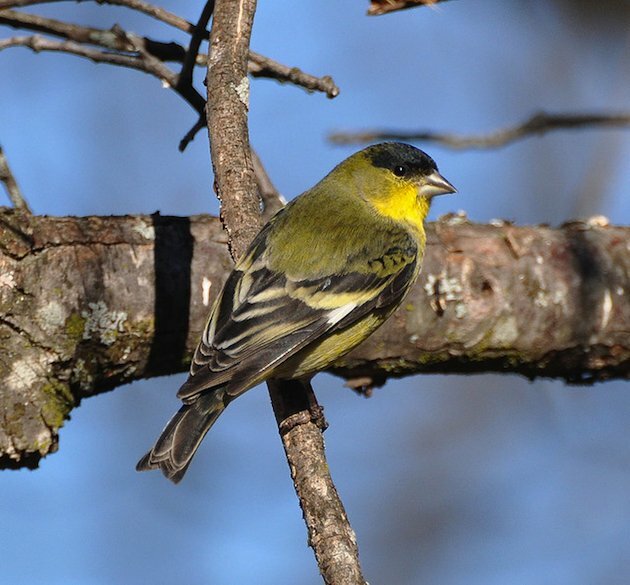 This spunky little finch is the smallest member of the North American genus Carduelis. I caught this male pictured above harassing a female Ruby-crowned Kinglet as she was bathing in the water feature. 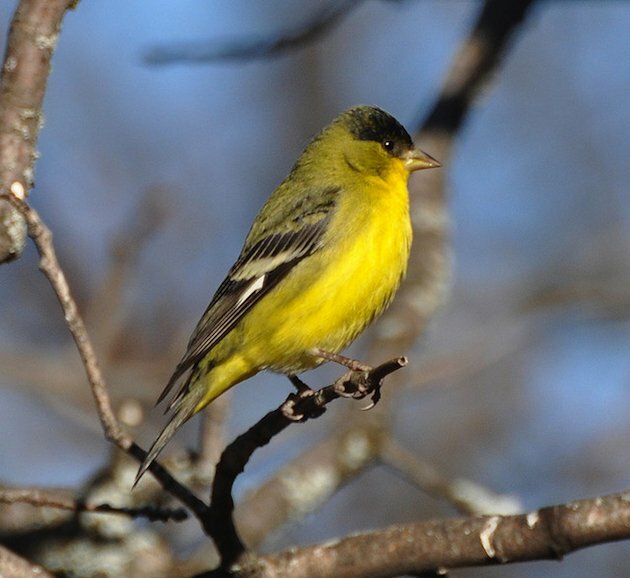 Unlike the more common American Goldfinch, the Lesser Goldfinch’s (Spinus psaltria) plumage does not change color during breeding season. The male (seen below) has a black cap and, in Washington, Oregon, California, and Baja California, nearly all males have green backs. 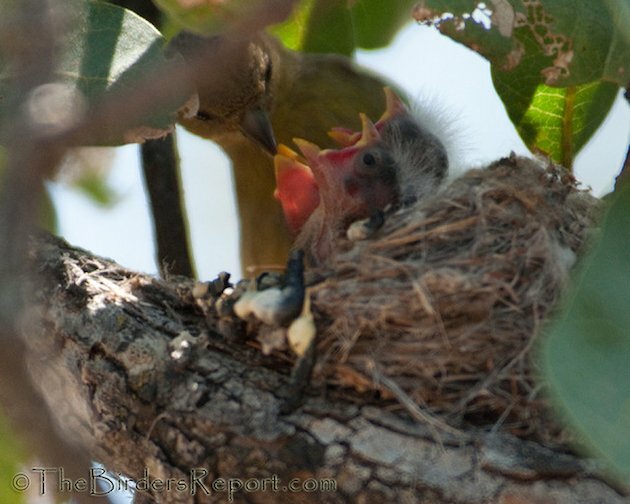 Eastward, frequency of individuals with black on auriculars, neck, and back increases; southward into Mexico, nearly all adult males have completely black upperparts1. Click on photos for full sized images. The male also has bright yellow underparts. 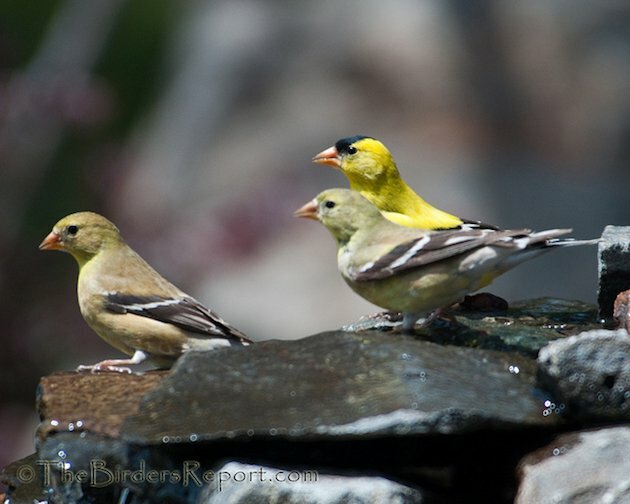 and these are American Goldfinches in breeding plumage. 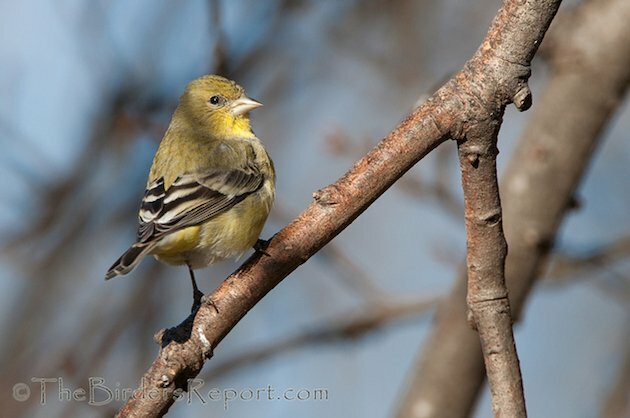 The orange beak on the female American Goldfinch and its white undertail coverts distinguish it from the female Lesser Goldfinch below, which has yellow undertail coverts and a darker beak. Both of these species show gregarious flocking behavior except when nesting. I was lucky enough a few years ago to spot a Lesser Goldfinch building a nest in a nearby tree while checking my Bluebird boxes. It was great fun watching them raise their young that summer. They always bring their youngsters to the feeders where, along with American Goldfinches and Pine Siskins, they not only make short order of sunflower and nyjer seed, they like to feed on sunflowers in the garden as well. You can hear the intricate call of the Lesser Goldfinch here. Lots of really cool shots (and video) there Larry! We get the Black-backed version in Costa Rica although it’s much less common. Trapping has extirpated many populations near San Jose but they ares still regular at high elevation sites like Irazu and Turrialba volcanoes and various places in southern Costa Rica. 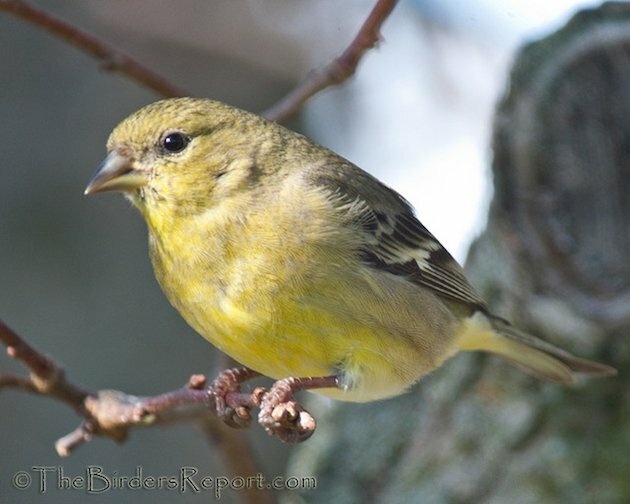 Lesser Goldfinch visitors to our feeder disappeared last week overnight! We live in Southern California. I suppose they must migrate to Mexico in the winter? Like Sharon Hunt (12-15-13) a group of us have noticed this disappearance in San Diego (Sept/Oct) . We are wondering where they go. They just reappeared yesterday (10-11-15). Sun flower leaves and tall verbena are also favorites for food. So are THEY are the ones eating the sunflower leaves? All these years, I thought it was insects, but now, not so sure.